I'm not sure if there is an area for this already, but I was going to list a few observations after upgrading from v7 to v8 so far. 1. Full backups this weekend were synthetic and took 20 hours instead of the usual 30 hours. So a 33% decrease in time from v7. 2. Files to tape took 4 hours whereas they were taking 7 hours with v7. I believe this is due to the issue with indexing and large numbers of small files that VEEAM struggled with before. The upgrade was smooth and fast. No negatives or warnings to speak of so far. Thanks VEEAM! Yes, these enhancements are mentioned in our What's New doc, so thanks for confirming it in your environment. BTW, what is used for your target storage for the backup jobs? Yep, I expected to see improvements, I was just giving some actual numbers to show other users what I saw. 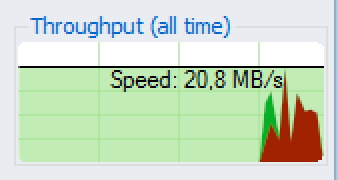 We only have HP MSA SAN that the VEEAM server is connected to via 1GB iSCSI. This link is pretty much maxed out during backups, so I'm sure it is a bottleneck. To see the improvements I mentioned must show that there are other efficiencies that help reduce the backup times. To be absolutely honest, I did not expect improvement in synthetic full performance on existing jobs, so this is an interesting observation (even though I have no explanation for that). May be one of those quiet "under the hood" improvements that did not even make it into What's New. Thanks for sharing! last night was the first night of v8 here. I was expecting longer times because the greater part of my VMs have disk increased in size since their birth, so the CBT has been reset to workaround the known bug. I think i'm seeing shorter times instead. Keeping an eye on this. I marked the time increase in v8 in bold. You can see that activity is only at the end of the job. I do not have a screenshot from v7, though. It was a lot more even distributed, as in "action" from start to finish as opposed to only "action" at the end. Reverse Incremental with hot add, happens when I change to network mode, too. Another observation: if I create a new backup job (same settings) it works fine and fast. In the new v8 Tasks i didn't find a constant which takes always longer. You can map the new job to existing backup chain to continue it. I am in the same boat where my backups have gotten longer times now. The post was moved to the Hyper-V forum but it seems that the hypervisor doesn't matter. Create a NEW Backup Job and adding the existing backup chain didn't solve the longer backup time. Its the same as before. After some time (usually more than an hour) it continues without errors and eventually the whole task Is complete. tinto1970 wrote: I was expecting longer times because the greater part of my VMs have disk increased in size since their birth, so the CBT has been reset to workaround the known bug. I think you are mistakingly thinking that v8 will do this for VM's that have their disk increased at one time. v8 will only do this for VM's who have their disk size increased FROM NOW ON. So you could increase the disk size of your VM's now, to trigger this (and check for CBT skip and larger timespan) or use the scripts provided in the KB or forum topic. I have just upgraded to v8 and started fresh with a new job, because previously i was using synthetic full. Now you can't to do active or synthetic fulls if you want to take advantage of the new "Forward incremental - forever backup method". See the Veeam v8 user guide. Will let you know my findings, job is running. Any comment from Veeam on this one? I have not yet upgraded and I´m not sure I should unless these longer backup times has been fixed. Are there any statistics on how many customers there are experiencing changes in backup times (faster/same/slower) ? For me, longer backup times would render the system unusable. I am working one on one with Veeam on a couple of scenarios. I am currently running version and version side by side with the same jobs to see what the issue is. I will posy results as we find them.